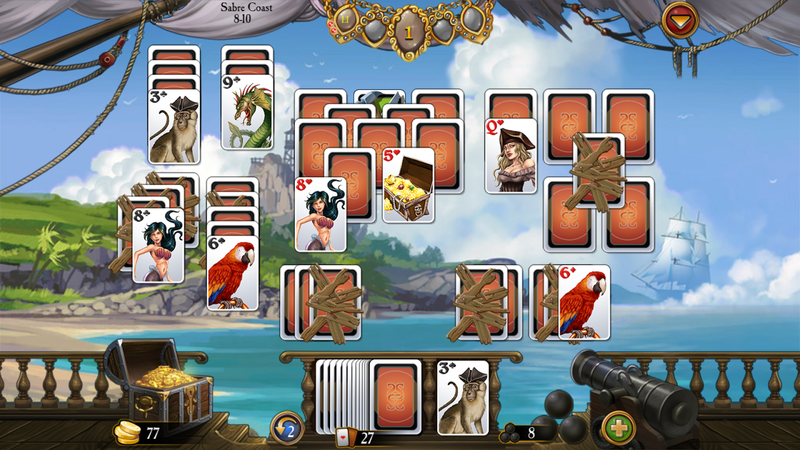 Firstly, Download APK file of the app Seven Seas Solitaire 1.0.1 for Android. Avalon. A land of lush forests, great plains, tall mountains... andmost of all, magic! The Druids of Avalon wield powerful healingmagic, activated through the use of magic cards. Just likerunestones, the magic of the cards is unlocked by placing them inthe correct order.Travel through 200 unique levels, collectingmagic cards along the way in your quest to reassemble the Deck ofNature. Set up huge combos to maximize your score multiplier, andcash in your winnings at the store for powerful bonus items.Collect wild cards, and use them wisely to achieve perfectresults!This is solitaire at its best - relaxing, addictive, andchallenging. With 12 bonus items to buy, 13 awards to unlock, andmultiple challenges to overcome on the way, Avalon LegendsSolitaire will provide you with hours of card-stacking fun. *Addictive game play* 200 levels* 13 awards to unlock* 12 powerups**** FROM THE CREATORS OF ****- Seven Seas Solitaire- MagicHeroes: Save Our Park- Arizona Rose and the Pirates' Riddles-Mystery MosaicsVisit www.anawiki.com to find out more games wecreated. A clever code holds the key to buried treasure!Arizona Rose: humbleantique collector, or treasure-hunter extraordinaire? Whileshopping for exotic antiques, Arizona stumbles across some oldmaps, which turn out to hold the key to Blackbeard's losttreasures! But the treasures' locations are concealed by a clevercode, and Arizona needs your help to crack it.Join Arizona on herepic treasure-hunting quest, with over 200 levels of picross tosolve and numerous treasures to discover. Along the way, you'llalso collect powerful items to help you and encounter hidden objectscenes and other exciting mini-games. You can also show off yourpuzzle-solving prowess by collecting all 15 achievements!Whetheryou're a picross fanatic or a first-time solver, Arizona Rose andthe Pirates' Riddles will keep you coming back for more. There'salways one more puzzle to solve, one more cave or shipwreck toexplore, and one more treasure to take home at the end!- Addictivegame play- Over 200 levels- 15 awards to unlock- 5 power ups-Clever mini games and hidden object scenes!A game to enjoy forpicross, nonogram, hidden object and puzzle game fans. Get ready to go on safari in this epic match-3 adventure game!Travel the world, from the ocean to the savannah and from theAmazon to the Arctic. Collect photos as you go. Swap and blast yourway through 300 levels of entertaining, casual puzzle action! Grabyour camera - careful you don’t drop it! - and keep your eyespeeled for the colorful parrot, the lazy sloth, the slippery frogand 50 other animal friends. This game has eye candy galore. It’smore fun than a trip to the zoo, and you don’t have to wait inline! Watch out for the ferocious tiger and sneaky anaconda,though, they’ll make your legs turn to jelly! Animal Drop Safarifeatures excellent replayability! Super high scores and excitingadventures await the attentive explorer. Connect your power ups toset off incredible combos: crash, boom, bang! Try to get a blitzgoing when you complete a level to score mega points: splash! Canyou get three stars? As you advance through your photographiccrusade, you’ll submit your best shots to a wildlife magazine. Mashthat shutter button, because those pics are worth hard cash! We’renot talking lollipop money, either: You can use your earnings tobuy power-ups, continues, extra lives and more. Anawiki Games is aveteran developer of casual games for all audiences, from match-3to solitaire, picross and more! A free solitare game with classic tri-peaks puzzles. Wander in theEnchanted Woods, take a rest at the Dragon Falls, solve the secretpuzzles at the Mystery Castle and the fairway along with many othersurprising and exotic locations! Choose your own choices, play withnew fun cards in every episode. If you're familiar with golf,castle, freecell, spider, klondike or pyramid versions, you'lldefinitely love this tripeaks game! The evil witch is challengingyou to play the most addictive card puzzle. She has a cursed deckwith many trick cards, illusions and mystery! Join Dex the Dragonto explore fantastic landscapes, discover magic cards, get thehighest score and compete with friends through amazing levels ofmystery! Solitaire Story is FREE and has NO TIME LIMITS! ✓Experience addictive gameplay all along 860 levels - with more onthe way! ✓ Explore fantastic landscapes and magic cards! ✓ Usepowerful BOOSTERS to get through challenging levels! ✓ Getunlimited CHARMS like Bonus Score, Max Life, Double Coins and moreto speed up your game! ✓ Crack free SURPRISE eggs to win rewardsevery day! ✓ Compete with your FRIENDS on leaderboards at everylevel! ★ TEST YOUR TRIPEAKS SKILLS! Test your tripeaks solitaireskills by playing with classic playing cards as well as many othertrick cards, all with a different and exciting challenge. It’sextraordinarily addictive! Clear the cards in numerical order toget all the witch cards and defeat the evil witch to continue yourjourney through a variety of levels and maps! Make 5 move streaksto crack the dragon’s egg and win awesome bonuses like an extraJoker or extra Cards! ★ UNLOCK AMAZING BOOSTERS AND CHARMS!Supercharge your card game with a variety of Boosters and unlimitedCharms to send your scores soaring. Enhance your tri peaks gameexperience in seconds! From “Double Coins” to “Maximum Life”,you’ll have a blast using Charms to speed up your game! ★ PLAY WITHYOUR FRIENDS! Connect with Facebook to see your Solitaire Storyfriends so you can compete with them in the Leaderboard! Help yourfriends by sending extra lives and moves and get bonus gifts inreturn! More friends means more progress! ★ FOLLOW US! Don’t forgetto like our Facebook page to follow the latest news and win freegifts: http://www.facebook.com/solitairestorygame Follow us onTwitter to get the latest news: https://twitter.com/solitaire_story©2015 Gamegos, all rights reserved. Spider Solitaire Pro is the #1 classic free spider solitaire ofcard game in the GooglePlay. If you like spider solitaire, you'lllove to play spider solitaire classic free card game!! This newfully featured spider solitario is the best classic spidersolitaire card game you'll ever play! From the amazing beautifulBackgrounds and Daily Challenges to the classic intuitive gameplay, we promise the most robust and satisfying experience you willfind on your phone. You’ll receive a unique Daily Challengeeveryday. Solve the Daily Challenge and receive a crown for days.Earn trophies each month by winning more crowns! Your DailyChallenges, crowns, and current trophy status are available to viewany time. Play the current day’s deal and replay it as many timesas you’d like on that day. If you are a big fan of spiderSolitaire, spiderette, Bridge, classic Klondike solitaire, FreeCellSolitaire games, Pyramid Solitaire, Casino card games or any othercasual card puzzle games like Cribbage, you will love thisspectacular game! Spider Solitaire is a very funny classic cardgame for the whole family and all people. You can move cards with asingle tap or drag them to their destination. You can either playthe easy 1-suit games, or if you feel up-to the challenge, try yourluck with 2-suit, 4-suit, or even Spiderette game modes. PlaySpider Solitaire Free!! Play Free Spider Solitaire!! SpiderSolitaire Pro Game Features: - Daily Challenges - Winning Deals -1-Suit games (Easy) - 2-Suits games (Medium) - 4-Suits games (Hard)- Standard spider solotaire rules and scoring - Single tap or clickto move a card or drag cards and drop cards - Unlimited Undos -Smart Hints show potentially useful moves - Portrait and Landscape- Left handed and Right handed - Interruption friendly with autosave data and resume - Fun and stunning winning animations -Beautifully crafted and curated themes - Custom Card Backs andFaces - Custom Backgrounds If you've ever played solitare (alsoknown as Patience or Klondike) or any of its variants such as TriPeaks, FreeCell, Spiderette, Blackjack, Video Poker and other pokercard games, then you are going to love spider solitaire classic onthe mobility! Play spider solitaire classic card game for freetoday! !